This page provides details to people who found a computer device with an OpenFortress Return Label attached. 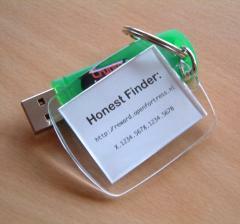 You found a USB device or a smart card with one of our labels attached? Then you are probably entitled to a reward! The device is meaningless to you, but its rightful owner is willing to pay a reward to the Honest Finder. Please enter the serial number (like X.1234.5678.1234.5678) in the form field below. We will then lookup your reward.